As a river ending point where fresh and sea water meet to form brackish water, the Nakdonggang River Estuary is a treasure of biological diversity. Here the ecosystems of the river and sea transform the area into an ecological rich costal region which serves as a breeding ground for numerous birds, fish, shellfish, seabed animals and insects. It also serves as the place of vivacious activities for harvesting and cultivating marine and fishery products. It is of key importance that the Nakdonggang River Estuary environment maintains its condition to allow organism to thrive and provide abundant food. 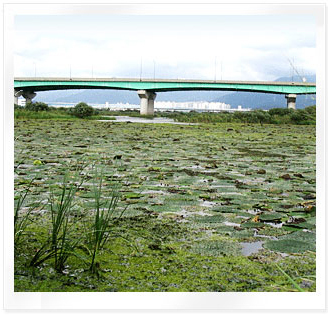 This environment is the most ideal for marsh organisms. The microscopic protozoa are prey for the bristle worms, which in turn are prey for the laughing gulls, snipes and kentish plovers. The fish provide abundant prey for guillemots and little grebes. Sometimes an awe-striking natural phenomenon occurs when many guillemots gather together as eagles have been known to prey upon them at times. The Nakdonggang River Estuary provides the perfect setting to witness the harmony found in Mother Nature and a diversified array of magnificent species.